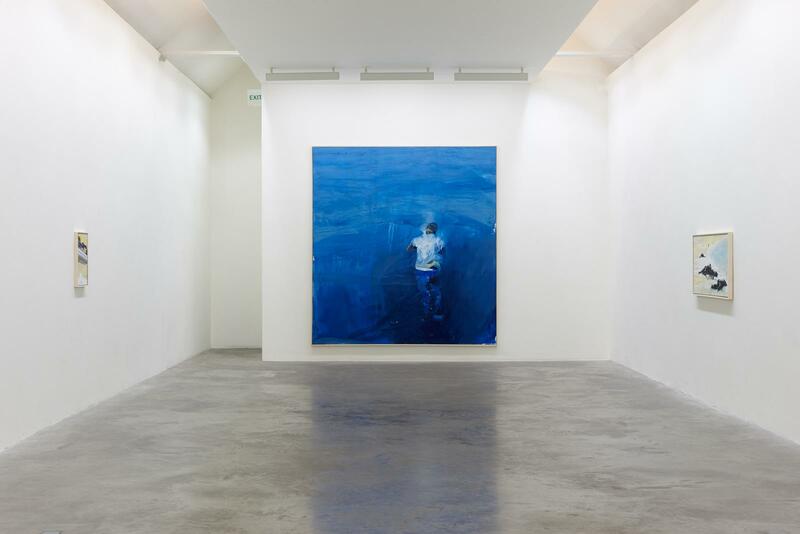 Kerlin Gallery is very proud to present Over Our Heads the Hollow Seas Closed Up, a new exhibition of works by the celebrated Irish painter Brian Maguire (b. 1951). The exhibition opens on Thursday, 30 June, with a reception for the artist and continues until 20 August. Since the very beginning of his career in the 1970s, Maguire has approached painting as an act of solidarity. He operates a truly engaged practice, compelled by the raw realities of humanity’s violence against itself, and the potential for justice. 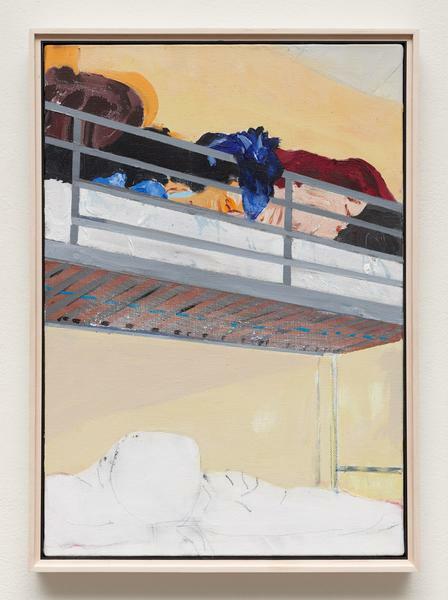 Maguire’s preoccupations draw him to the margins of the art world—alternative space, prisons, women’s shelters, and psychiatric institutions—making shows in traditional gallery and museum spaces something of a rarity. The title of this new body of work, Over Our Heads the Hollow Seas Closed Up, which is taken from Primo Levi’s If This Is a Man, which in turn is quoting from Dante’s Inferno. In these paintings, Maguire directly confronts issues of migration, displacement and human dignity in the face of the current global unrest. This kind of work is difficult to accomplish, since narrators of stories of this kind, if they care, have a fear of exploiting grief as they walk the high wire between narrative and voyeurism. 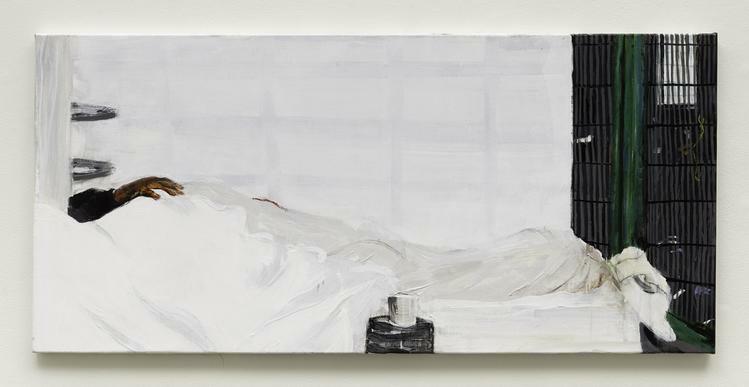 With Maguire, however, manipulation is entirely absent from the telling and painting, per se, is to the fore. 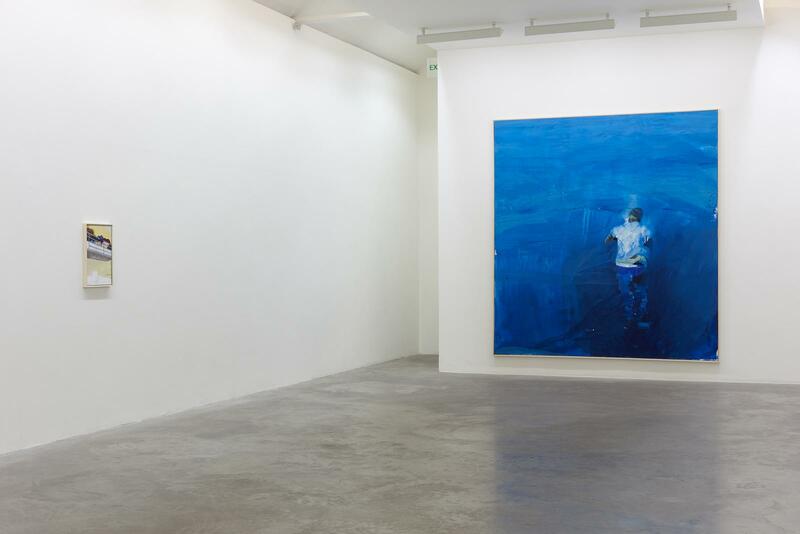 The paintings in this exhibition are some of Maguire’s most nuanced and ambitious to date, which he has crafted with larger brushes and thinned-down acrylic on canvas. He works slowly, using photographic sources, searching for that point where illustration ceases and art begins. This growing contrast between the seductive painterly aesthetic and the subject matter only adds to the potential impact of these formidable canvases. 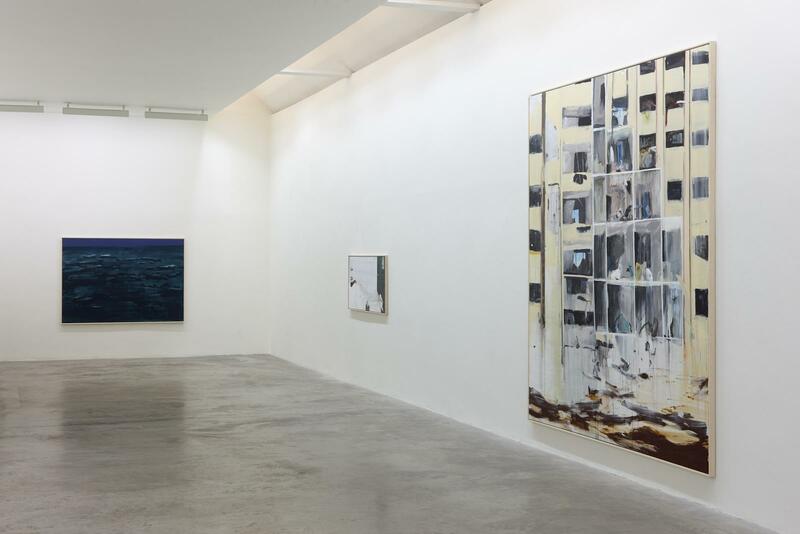 Maguire’s most recent solo exhibitions include The Void, Derry (2015–2016) and Fergus McCaffrey, New York (2015). 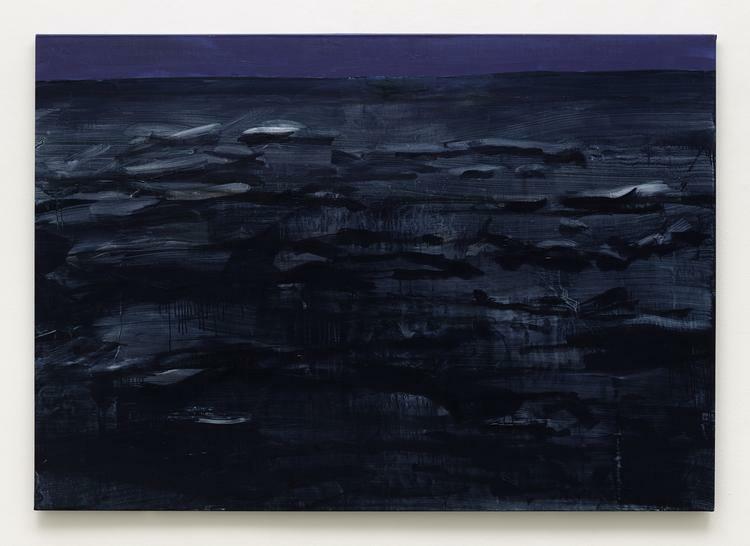 Group exhibitions and biennales include the Irish Museum of Modern Art; WIELS, Brussels; VISUAL, Carlow; Dublin City Gallery The Hugh Lane; National Gallery of Contemporary Art, Korea; Hokkaido Museum of Modern Art, Japan; Dublin Contemporary (2011) and the 24th Sāo Paolo Bienal (1998). 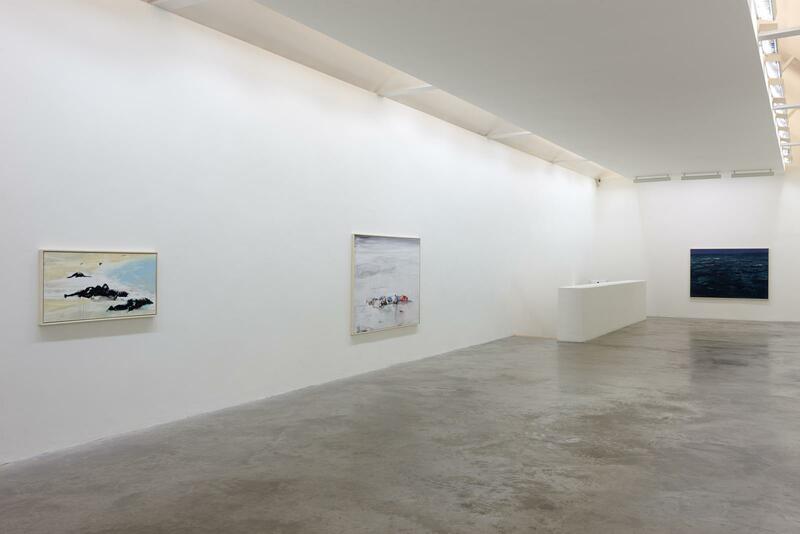 Maguire’s work is held in numerous public and private collections including the Museum of Fine Art Houston, USA; Museu de Arte do Rio, Brazil; Irish Museum of Modern Art; Dublin City Gallery The Hugh Lane; Trinity College Dublin; Alvar Aalto Museum, Finland; Gemeentemuseum, Den Haag, Netherlands; Wolverhampton Art Gallery, UK and Crawford Art Gallery, Cork. "With a practice rooted in expressionist painting, Brian Maguire has consistently addressed the experiences of society’s outsiders: the marginalised, alienated, ostracised, dispossessed, abused and discarded. Underlying his stance is a distrust of institutional authority and values, on a par with Michel Foucault’s critique of the nature and functioning of social structures …"
"Brian Maguire has never shied away from unpalatable subjects. His previous work has dealt with such topics as the gruesome consequences of drug wars in Mexico, the brutal reality of feminicidio (the killing of women simply because of their gender) and institutional life in psychiatric hospitals, prisons and women’s shelters…"
Born in Co Wicklow in 1951, Brian Maguire is one of the most socially engaged artists of his generation. He has painted in prisons and psychiatric institutions, with and for residents of Sao Paulo’s favelas, and produced portraits of victims of feminocide in Mexico’s Ciudad Juarez. Injustice, human rights, social issues and the darker side of humanity are triggers for his art. 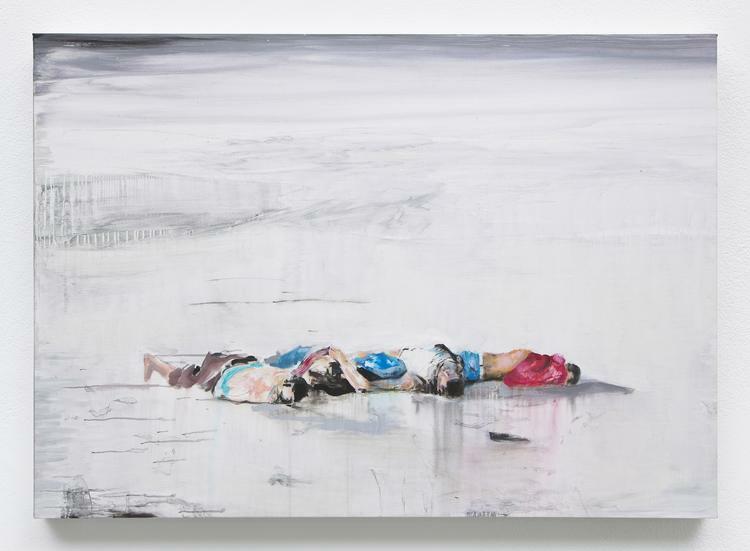 His latest work is about migration and global unrest, and there are four remarkable paintings in the show. Apartments Aleppo shows a multistorey accommodation block with its side blasted off. Paint drips at the bottom of the canvas, as remnants of fabric and upholstery flash in the exposed cubes like snippets of the former residents’ lives. The show’s title painting is a monumental composition, made more so by the expanse of blue in which a man’s body floats, face down. 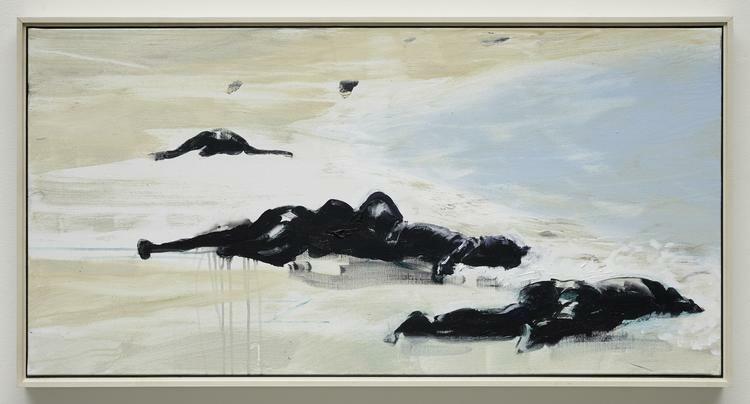 In Strange Fruit (Europe) and The Known Dead, Maguire paints bodies on a beach like rags washed up on the shore. It’s not easy viewing. 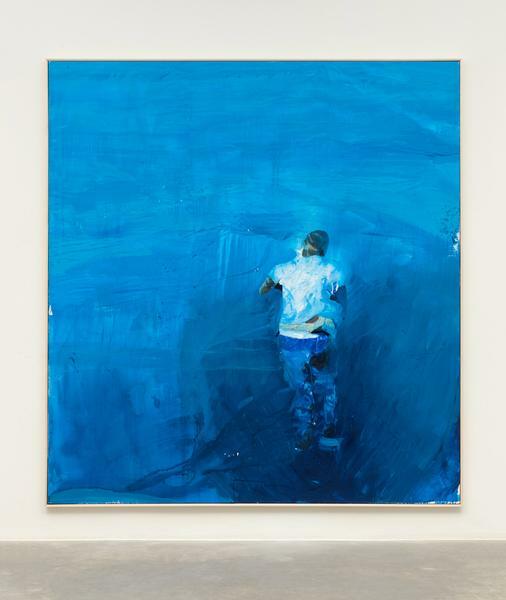 He entices with colour and engages with dynamic painterly skill, all the while unapologetically revealing uncomfortable truths. "The Irish painter Brian Maguire is an artiste engagé, a secular missionary who devotes his talent to a form of social protest. He has taught painting to poor children from Palestine to Brazil, and to prisoners all over the world. 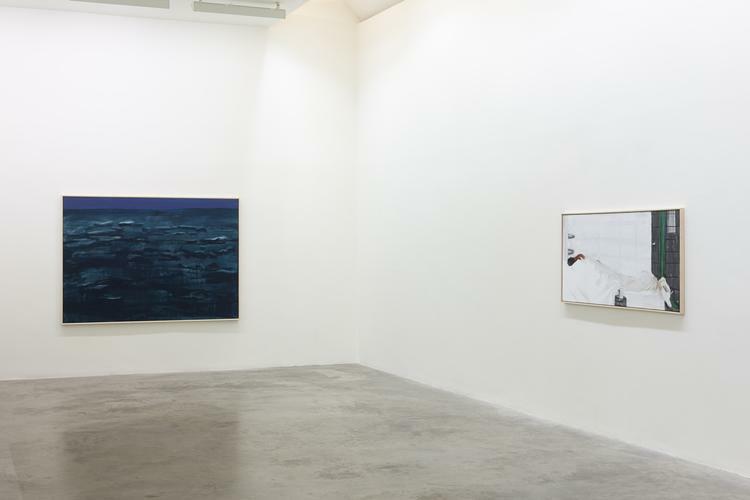 Over Our Heads the Hollow Seas Closed Up is the title of Maguire’s exhibition at the Kerlin Gallery in Dublin until August 20th. 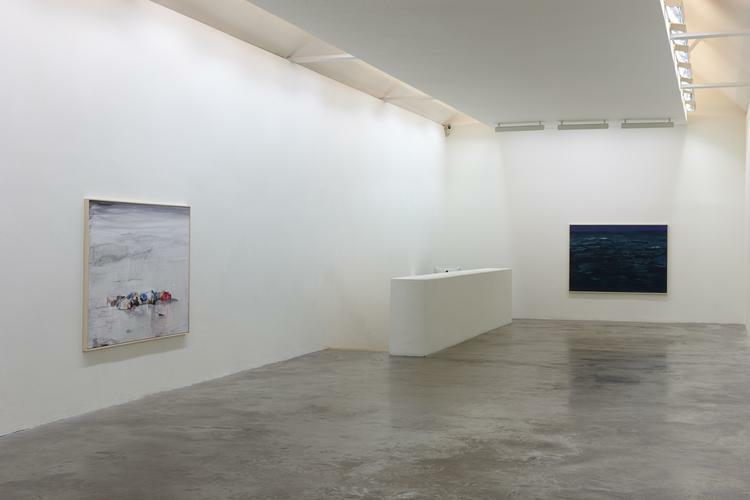 It is taken from Dante’s Inferno, as quoted in Primo Levi’s Holocaust memoir, If This Is a Man …"
Brian Maguire talks about why issues of migration inspired his collection Over Our Heads The Hollow Seas Closed Up, which is currently showing at the Kerlin Gallery. "Brian Maguire never paints a pretty picture. 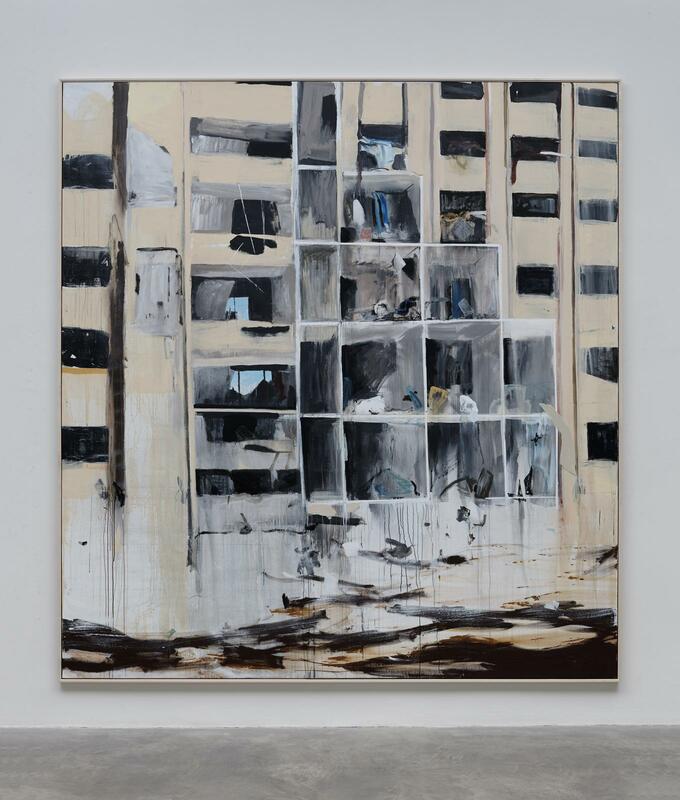 His work has captured prison life, psychiatric institutions, women's shelters; he has met with families of Mexican factory girls – abducted and killed – and painted their portraits; he has given us images of abandoned buildings from the crash. Now, he has turned his angry and passionate attention to one of the most devastating phenomena of our time – the plight of the migrant …"
Over Our Heads the Hollow Seas Closed Up is a collection of new works by Irish painter Brian Maguire, in which he extends his sociopolitical focus, which began during the Troubles, to exploring migration, borders and displacement. His sensitivity to his subjects sets him apart, having worked in prisons, asylums and shelters, and he has shown a committed and immersive approach throughout. The title for this new body of work comes from Primo Levi’s If This Is a Man, itself a quote from Dante’s “Inferno”. The significance, here, is displacement and unrest, and a concern with storytelling and narrative rather than voyeurism – a difficult line to walk. Maguire’s sources are photographic, impactful in their contrast of aesthetic and subject matter.